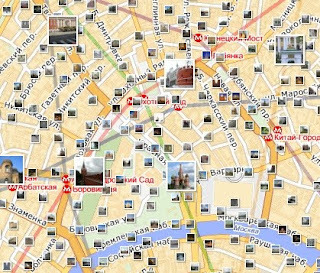 Moscow has many churches. The city is sometimes referred to as "40 by 40" to denote the fact that it has some 1,600 churches that are sprinkled around town. There are many "unexpectations" about these shrines, some of them quite magnificent. For one, many are tucked in quietly in neighborhoods, often where one would not anticipate them. Another surprising fact, especially from an American's point of view, is the age of some of these examples of living history. The steeple of some 700-year old Visoko-Petrovskom Monastery is just a quarter mile away from my apartment and visible from my window. Karl Marx said "Die Religion ... ist das Opium des Volkes," often translated as "religion is the opiate of the masses." There is much more to Marx's argument than this infamous headline; but, this headline as it is, captures the general understanding that the West has of the former Soviet Union. From a Western perspective, religion was the bane of communism and, therefore, communism set off to destroy it and decreed atheism as the way of the land. Hence, it is an unexpectation to see these magnificent buildings preserved through changing times, seasons, and regimes. And it is an unexpectation to see these shrines revered by the young and the old today. To be clear, the Soviet era did have its destructive mark on Moscow's religious symbols. 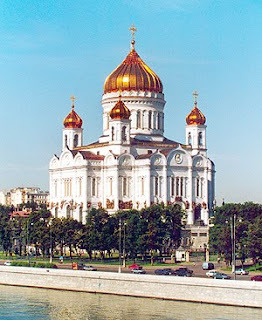 The enormous Cathedral of Christ the Savior, Russia's largest church and visible from almost anywhere in central Moscow, was completed in 1881 to commemorate Russia's victory over Napoleon's invading army. Alas, the church was demolished in 1933 on Stalin's orders. 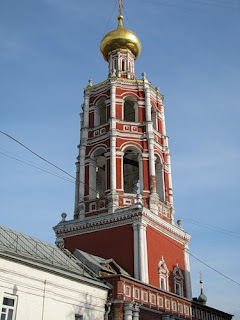 The church's destruction was to free the land for the construction of a House of Soviets - a gargantuan skyscraper intended for government authorities and the promotion of the Soviet regime. The building was to be topped with a 100-meter-tall statue of Vladimir Lenin. After the destruction of the church, the project languished and never got started. At some point, the building planners simply gave up and built a massive swimming pool instead. Per a former Russian government officials whom I consider a friend, "a miracle prevented the engineers from doing anything useful with the land because the ground kept doing funny things every time they wanted to build something." As far as I surmise, a massive swimming pool is "something" that is technically challenging to build and "useful." But never mind that; miracles are what they are. In yet another unexpectation, a replica of Cathedral of Christ the Savior - built in the 1990s to commemorate Moscow's 850th anniversary - now stands in place of the original. It is a powerful symbol in Moscow, and a reminder that miracles will happen, no matter how hard you wish them away.